Hang around creative types long enough, and you’re destined for a few run-ins with the f-word. Failure, that is. In the artistic process as in life, we’re challenged to take risks, to be vulnerable, to in the words of Steve Jobs, “Stay foolish.” Creative endeavors demand a dose of foolishness because here, failure is not a possibility. It’s fate. …And that can be a fantastic thing. When we fail, we’re given an opportunity. We’re called upon to make a move. Our chosen response typically falls into one of two categories: Pivot or pull the plug. How do we know when a project is worth a pivot? How do we assess when it’s wisest to pull the plug? I generally find answers to these questions by returning to the purpose at the heart of the project. That’s the through line. Can I still envision this thing? Can I envision what it would be for people and/or for me? If our answer is yes, and the idea still seems good, then we’ve gotta do as Ira Glass says, and fight our way through. Why? Because that means it’s worth another shot. 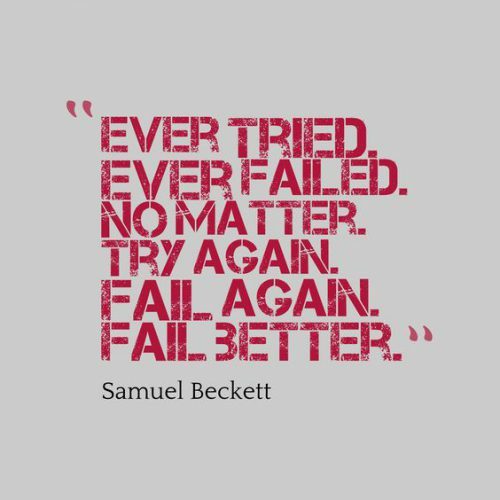 It’s worth, in Samuel Beckett’s words, a better fail.